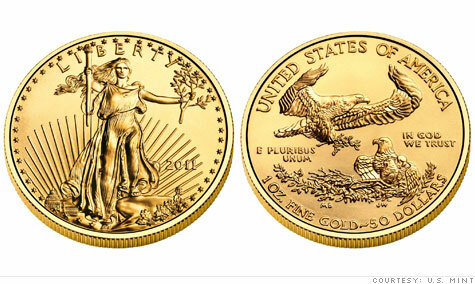 NEW YORK (CNNMoney) -- Gather 'round, gold standard enthusiasts. There is a new law in the state of Utah that might be of interest. The Beehive State has a new measure on the books that eliminates state taxes on the exchange of gold and silver coins and directs the legislature to study an "alternative form of legal tender." The law, signed by Gov. Gary Herbert last week, also recognizes gold and silver coins issued by the federal government as legal tender in the state. Of course, they already are. But people use them as investments, not pocket change. The big legal change in Utah is that the state tax code now treats gold and silver coins -- issued by the U.S. Mint -- as currency rather than an asset. That means no capital gains or other state taxes will be levied when the coins are exchanged. The law has limited applications. As currency, the gold and silver coins, which are usually purchased by individuals as investments, are still only worth their face value in the eyes of the state. So even if the actual precious metal in your $50 coin has a market value of $1,400, it still only has $50 dollars worth of purchasing power. According to a person close to Herbert, the governor signed the bill because it eliminates capital gains taxes on a popular investment. The other stuff, not so much. "If somebody is stupid enough that they want to buy a Snickers bar at 7-Eleven with a gold coin worth thousands of dollars, they will be able to do that," the source said. The new law is, of course, a shot at the Federal Reserve. And Utah isn't alone. A few other states are considering similar bills. Conservatives fret that the central bank has permanently damaged the value of the dollar by pumping trillions into the economy, drawing down the greenback's buying power. And Utah -- where the Tea Party has a powerful presence -- is leading the charge against Fed Chairman Ben Bernanke. Larry Hilton, an attorney who led the push to get the bill passed, doesn't envision people using the coins at, for instance, a 7-Eleven. But he said that by eliminating taxes on the exchange of the coins, they would be on the same playing field as paper currency. And, he said, banks might step in and create accounts backed by gold and silver coins. As for the committee that will study an "alternative" currency for the state, the source close to the governor threw cold water on that one. "There would be be some major constitutional issues with that," he said. Gold still cheap? Don't laugh.